Here's some of our Thanksgiving table decor this year. 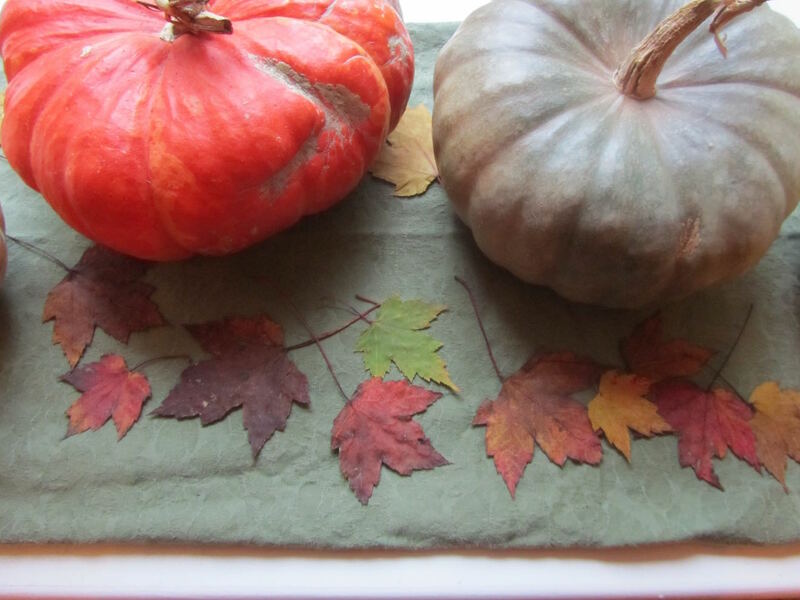 A table runner (kitchen table cloth, folded in thirds, lengthwise), strewn with pumpkins (free last week at the local garden center) and pressed autumn leaves. Last Friday afternoon, I went outside and collected a handful of wet leaves that had been blown off of our trees. I opened up a sheet of newspaper, and laid the wet leaves down. 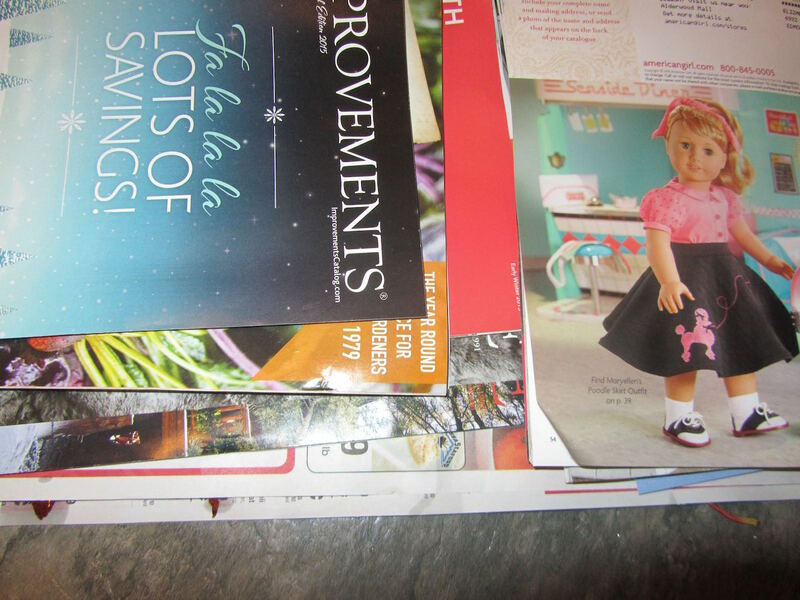 After folding the newspaper closed, I stacked an armload of catalogs on top, and left the pile sitting on the kitchen vinyl floor for a few days. 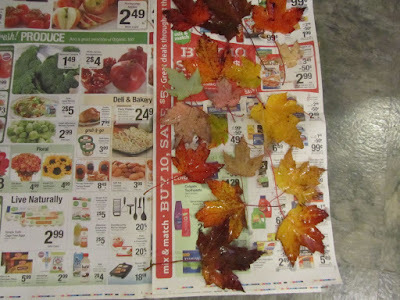 The moisture was soaked up by the newsprint, and the leaves were flattened nicely. A 5-minute project. Cost? Nothing. Satisfying? Absolutely. I'm in the same boat. No budget for a Thanksgiving get-together. We are going to mother-in-law for Thanksgiving dinner and we'll all bring something to put the meal together. I have to take veggies for 14 people. I am going to do the green bean casserole since everyone wants that. 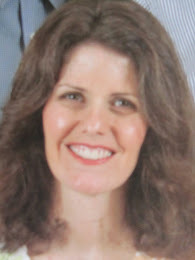 But we have friends (a little older than us, a retired teacher and physician assistant) who also want to have a get-together. But I need to have it at my house on the day after Thanksgiving because I want my parents and my brother to come. I do not have a single penny for buying anything for this meal. Dad can't have turkey since it gives him gout. I have to do this whole thing from the freezer and pantry. I will look for a chicken or legs/thighs in the freezer, I think I will maybe do scalloped potatoes, mashed squash, brown sugar carrots, maybe apple pie and pumpkin pie. I have some freezer pickles and I just don't know what else to add. It looks like I will have about 12 to 14 people as well! I have a ham in the freezer but I think I will wait until Christmas to use that. It is possible I will also do a pork roast with the chicken since I found a great deal on that a few weeks ago. Might as well! I probably will skip the table decor since table space is so limited. I could make cookies or something but I'll just have to see kind of time I have. Work is very busy that week especially the Wed. before Thanksgiving. If you do a green bean casserole, don't know if you remember, but I've posted how I do it, with a couple of substitutions for the more expensive parts (canned onions and cream of mushroom soup). 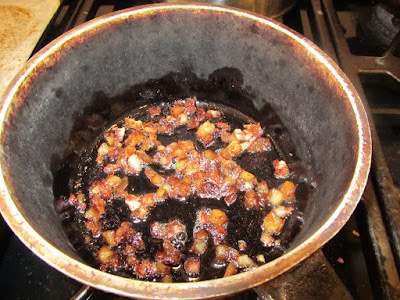 I make a canned onion substitution with bread crumbs, butter and thin-sliced onions. And for the cream of mushroom soup, I make a white sauce, using sausage or bacon fat (for flavor), some herbs (usually sage), onion powder or fine-minced onions, and maybe 1 or 2 mushrooms, fine-chopped, bought from the bulk bins of mushrooms in the produce section (but mushrooms are totally optional in my opinion). I just keep tasting the white sauce and adding bits of seasonings until it tastes right. I use the amount of my homemade white sauce in place of the amount of cream of mushroom soup plus the added milk to the standard recipe. It comes out to the right consistency, then. Your menu at your house sounds good. It's the people who will make the dinner memorable, not what you eat. In the original Thanksgiving feasts, they served whatever they had, obviously. No need to worry over not having something in particular. You could add homemade rolls (using a refrigerator recipe which allows you to make the yeast dough a day or two ahead), or a pan of cornbread. Also, since you're planning on mashed squash, you could use the carrots, fresh, on the tray with the pickles. It would give you variety of textures, and stand-in for a salad. Or, you could do a carrot salad (add raisins, or canned pineapple, or chopped apples, if you have any). And if you do add a pork roast, it will give you and your family a bit of leftovers of meat, to get through the following dinners that week. Wishing you well with your plans. You're right, why buy artificial leaves, real looks so much better. The fall leaves are beautiful. I don't know how (never preserved dried flowers before), but maybe there is a way to "fix" the leaves. I remember a spray we used to seal charcoal and pencil drawings in art class. Maybe clear acrylic sprays from the hardware store? Just my desire to preserve what is so beautiful and memorable to your family of the year the leaves adorned their kitchen table. Lately I've been thinking I should sign and date my craft work, not because I'm famous haha, but it will give so much "heirloom" quality to the pieces that I leave behind. I've kept handicrafts that my husband's grandmother and mother made to give to my chilidren. I wish they had signed and dated their work, so they can pass these treasures on. One of my drawing instructors told us to always date our work, even if it's just a sketch. So that we can track our own progress. I think it's good idea to sign and date what you hand-craft. Your grandkids and great grandkids will then have a record of who/where things came from. We have a quilt made by my grandmother-in-law, and it's in good condition. It's a shame she didn't stitch her initials into it. And have a great day too!! I love the pumpkins and the leaves. I have not pressed leaves in years. I used to press flowers in wax paper. How fun I am going to try this again. when I was a girl, and we'd visit my grandmother for Thanksgiving, she's send us out to choose some leaves from the yard. Then she'd press them between sheets of waxed paper, and these would be our Thanksgiving placemats. I thought that was such a fun thing to do, and would stand eagerly by her side while she ironed the mats. Very nice, Lili. 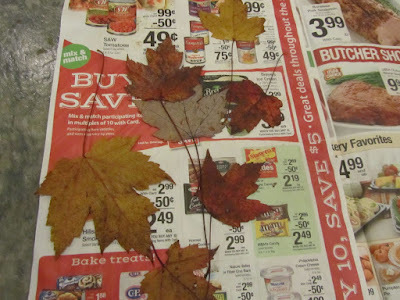 The maple leaves are so pretty right now, I think I will do the same thing. To me, there is nothing more beautiful than nature, and by bringing it indoors I get to enjoy it even more. 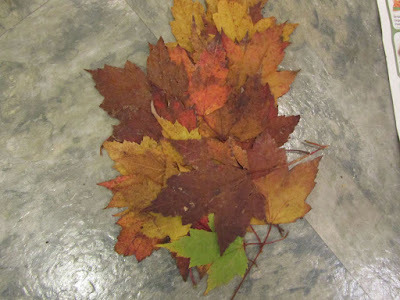 It is a funny perception that when the leaves are lying on the driveway, they are a mess. But when you bring them indoors, they're beautiful. I think we're supposed to be drawn to and find beautiful that which is in nature. And, as you said, having it indoors means we get to enjoy it even more. I think just about every little girl of our generation must have pressed leaves in waxed paper! I did do this with my kids, too, when they were young. It was always a fun activity to do in fall. Very pretty! I wonder if I'm the only person who always removes table decorations during the actual meal when we have company to make more space for the food! Actually, this is on a side area, the low china buffet, as I know there won't be much room for anything extra on the dining room table this year! On the table, itself, I've got some candles on pillars and some itty bitty pumpkins/squash. I think, though, it depends how you serve the meal. My mom always plated al of the hot things up in the kitchen, then had salads and relish trays on the table. Some years, we've set up a buffet (which we might do this year, too) on the kitchen counter. And some years, we bring everything to the table, and serve family style. When serving family-style there is no room for anything decorative. And it all gets lost in the myriad of platters and bowls, anyway. Very pretty, creative, and elegant! You do such a great job of making your table attractive. This is certainly an area I need to work on. My mom was really an expert on table decor. She did the most amazing and creative holiday table centerpieces. Maybe that was more of a "thing" back in the 60s and 70s. But I do think its the fun part of planning, for me at least. Besides ironing leaves between wax paper, we dipped them in wax--the kind you used to seal jellies. Some of them lasted for years. A friend showed me a craft today where she took a silver Sharpie and traced the veins in leaves and then sprayed them with Mod Podge. They were beautiful and the Mod Podge should help them last. Oh, how beautiful! I do a lot of gold things with Christmas, gold spray paint and gold pen. I'm now thinking about these leaves with gold accents!! Thank you for the idea!! I have spray clear coat, I think, too.